This colorful reception at the Third Degree Glass Factory was this past spring. 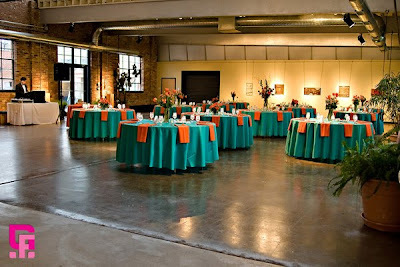 Teals and oranges were used to celebrate the bride’s Indian heritage. The flowers were a bright mix of oranges including roses, gerber daisies and tulips. The centerpieces alternated high and low vases for some table variety. This shot by Gail Fleming shows the whole room after it was set with linens and lighting. The room was splashed with color.